Please keep checking back as we update information on the Shepherds, and have more Shepherds coming into our care. Please be patient when applying to adopt with a rescue dog - from applying to meeting a potential dog will take 10+ working days. Please be made aware a home-check will take min. 30mins - 1hour. suitable poem of rescue dog or animal rescuer per month. Marcia ... 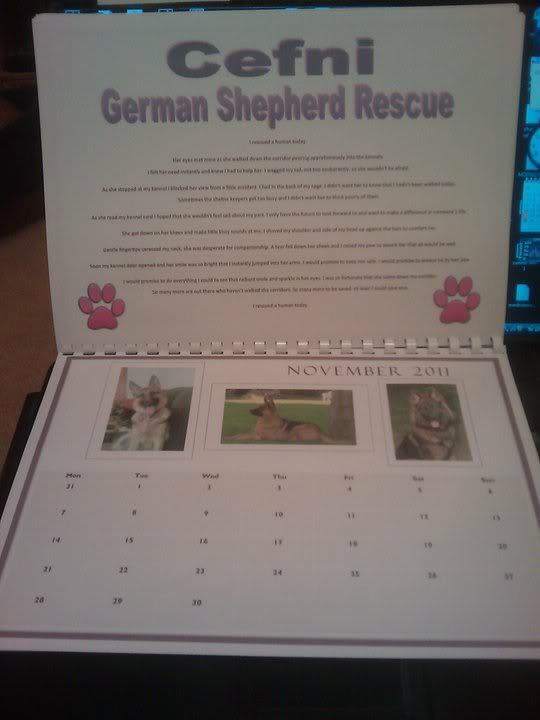 I just hope that I am not too late, to place my order for the new CEFNI 2011 GERMAN SHEPHERD CALENDAR.... PHEW! I suspect that they are flying off the shelves as I write! 2011 ' Calendar Girls ' one .... Well, it's not really that surprising, when you consider the beautiful line-up that has been put into the CEFNI CALENDAR ! When you add to that, that the CEFNI CALENDAR is in support of the very, VERY, best of causes ... What CEFNI / GERMAN SHEPHERD supporter, would want to miss out on being able to support and be part of such a wonderful and worthwhile cause. After all, as my old Shepherd, 'Simba' used to say .."You Know I'm Worth It" - And Boy Was He Right! Otherwise I can see that I'll be the only person in the UK, who hasn't got a CEFNI GERMAN SHEPHERD CALENDAR, in his stocking, come Christmas Day... And that wouldn't do now... would it! Hope you received the posters in the mail this week. I am completely new here but I would love to have one of those brilliant calanders. How do I go about ordering one? If you use paypal we accept or you can send payment in the post which ever is easiest for you. Yes I can do paypal that would be great! please state how many calenders (we do have other rescue merchandise available too) and of course your address where you wish your order sent too. Would I send you an email with my address in and then send the money via paypal? Sorry, i'm not entirely sure how to go about this lol. Thank you! I have completed the process! Looking forward to getting the calender. as i put my gsd to sleep in june and miss him dearly. can atleast be involed in them. Thanks again. Helen if you want to help out in any way at all to keep your finger in with the Sheps let me know, we are always looking for experienced people even if it is just an hour a week (or more of course). Sometimes people call up needing advice on certain areas with German Shepherds and somebody like yourself with the experience could help that person no end. Let me know and we can get you set up and into the other area of the forum with the volunteers!